Karen has been nursing since 2001. She began her training at UWE on the BSc VN course, then going on to finish at a foster practice in Hampshire. In 2005 she began working at Cedar Referrals, where she gained valuable skills and knowledge in both surgical and medical nursing. Finding a particular interest in neuro-diagnostics/surgery and rehabilitation, she moved to work within the neurology department in 2009. 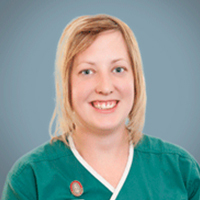 In March 2013, Karen passed her City and Guilds certificate in Emergency and Critical Care. In 2015, Karen became one of only a handful of UK members of the Academy of internal medicine for veterinary technicians (AIMVT) to achieve this Karen had to complete a formal process of education, training, experience and exams in order to be recognised as a Veterinary Technician Specialist in neurology, something to be very proud of as she was the first in the UK.